A surgical side rail clamp that can be attached to virtually any operating table. Snaps on anywhere along the rail and accepts both round posts and flat blades. This Clark Socket is engineered to mount surgical devices and accessories with flat blades or round posts up to 3?4" diameter. 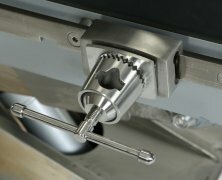 Easily attaches to any standard surgical table side rail, anywhere along the table’s (or table extension's) standard siderail. Provides height and angle control with a single lever, simplifying the attachment and quick removal of accessories.